A new You Tube video "Ain't Gonna Teach To The Test No More" to the tune of "Gonna Lay Down My Sword And Shield..." is going viral on You tube, thanks to the talented group that began with Occupy Chicago. Hopefully as children arrive at classes all over Chicago today, the first thing on the music agenda will be "Ain't Gonna Teach To The Test No More..." (if the school still has music) We will be working on getting all the words to the musical, but the graphics, wonderfully selected, are also part of the story, which would fit nicely on the Main Stage at Second City. I'll be posting my full prepared remarks from yesterday's Board of Education meeting later today, following several of our Substance stories on the Board meeting (which was about a lot more than "pension reform" and the latest round of lies from the CPS administration). One of the most powerful presentations was given by an elementary student, Eleanor Griffin of Audobon School, who deconstructed the NWEA MAP to the joy of everyone listening and the rage of David Vitale, Barbara Byrd Bennett, and the Rahmclones sitting there listening. The official topic of Ms. Griffin's report was "Against NWEA and standardized testing..." which, when it is available on video, will make a great addition to "Ain't Gonna Teach To The Test No More." A dozen speakers at the Board meeting also denounced the so-called "Student Based Budgeting" which has been gutting the schools. The entire edifice of austerity will be tumbling down as soon as the Board finally releases the FY 2013 CAFR, which shows that CPS did NOT have a "billion dollar deficit" but instead was generating a huge surplus (which it has tried to cover up) during the 2012 - 2013 fiscal year. With only five of the seven members of Rahm Eamnuel's Board of Education present at the February 26 meeting, the Board barely had a quorum. The Board members had ordered CPS security and CPS "Communications" to restrict and spin the press as much as possible, with David Vitale personally ordering Jadine Chou, head of CPS security, to order Substance not to move around during the Board meetings. 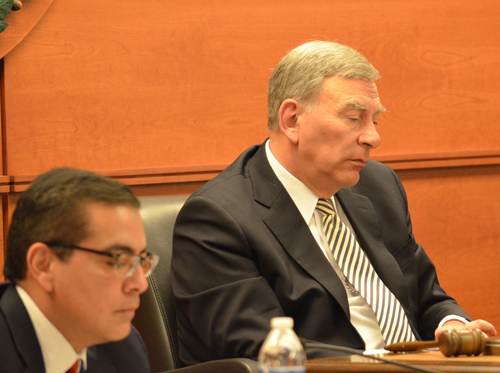 The Board members also could barely contain their rudeness during the public participation. Above, Board Vice President Jesse Ruiz and President David Vitale were trying to ignore Audobon Elementary School student Eleanor Griffin, whose presentation desconstructed the NWEA MAP testing program completely undermining the newest CPS high-stakes testing. Substance photo by George N. Schmidt.A lot more happened during the February 26, 2014 meeting than has been reported in the Sun-Times and Tribune. Hopefully, some others will be reporting the details in more details. But even if they don't Substance will. A growing number of public school students are speaking out at meetings of the Board of Education. 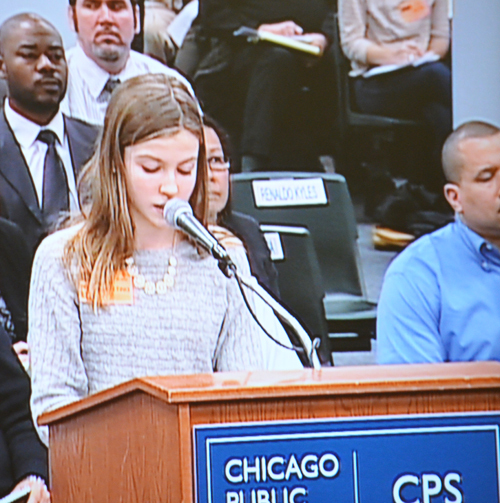 One of the most eloquent at the Board's February 22, 2014 meeting was Audobon student Eleanor Griffith, who read from a carefully prepared presentation that told the mistakes of the NWEA MAP testing program, which CPS has announced will be used for high-stakes testing in the future, as the ISAT has been declared obsolete. 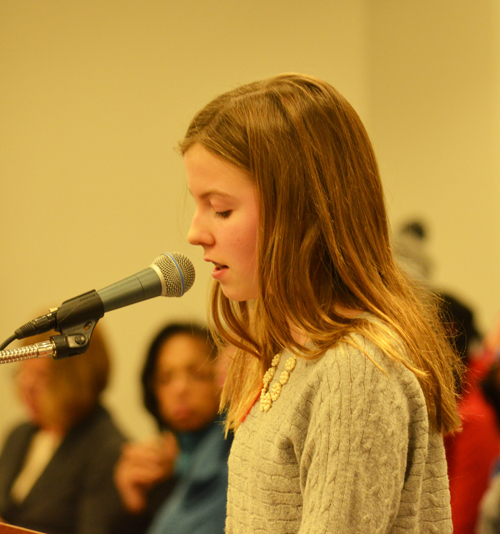 One of many students who have been analyzing and criticizing the standardized testing fetish of Chicago's mayor and his hand-picked public schools leadership was Audobon school student Eleanor Griffith, who spoke with precision to the February 26, 2014 meeting of the Chicago Board of Education. Ms.Griffith told the Board that she had critically analyzed the NWEA MAP test and that the test was offensive: it didn't test what the children had been taught, often demanded that they know subjects above their grade level (e.g. high school math), and created a poisonous reality in the classroom (by forcing children to view one another as numbers that indicated that some were "better" than others). Substance photo by George N. Schmidt. Other students who spoke against Board policies during the February 26 meeting were Jasmine Marchan of Ames Middle School and Avelardo Rivera, a deaf student, of Whitney Young Magnet HIgh School, who spoke to the Board using American sign language.